FEATURING the artworks of Bird, Clare Bowers, CASH, Brian White, Robroy Chalmers, Larry Cyr, Pamela Davis, Billy Dyson, Jon & Tracy Haaland, Brad Strain, Michelle Smith-Lewis, Rick Simpson, Joey McChan, Mark Walker, and Vern White! THE GOOD, THE BAD & THE UGLY is a collaboration between 3 Seattle art galleries, showing over 35 artists in a combined show during the month of July. Go to all three shows for a chance to WIN A PIECE OF ORIGINAL ART in a raffle! The winner will be announced at the end of the show(s). There will be raffle cards at each location – you need to get a stamp from all 3 to qualify for the drawing. GET OUT AND SEE LOCAL ART!! THE UGLY portion of this show will be featured at Twilight Artist Collective. 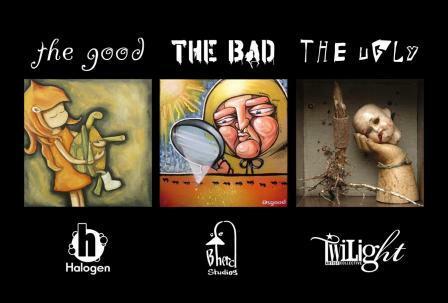 THE GOOD can be viewed at Halogen (2316 2nd Ave, Seattle, WA 98121), and THE BAD at Bherd Studios (8537 Greenwood Ave. N, Suite 1, Studio D, Seattle, WA 98103). Like the artwork featured on the flyer? Visit all three galleries to be eligible to win these works in a raffle!